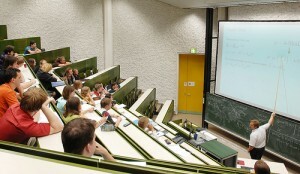 2) Talking in lecture – running commentary and intermittent giggling during class are generally not appreciated. That is, unless you are most incredibly witty or look and sound like James Franco. 3) Online shoppers, Facebook creepers, Twit-a-holics – Why are you in class anyway? 4) Rushing out of lecture – professor hasn’t even finished her sentence and the rustling of your backpack has made listening to it near impossible. 5) Sandwich makers – that’s right, you read that correctly. The most bizarre lecture hall behavior we have ever witnessed thus far is someone taking out vegetables and assembling a sandwich, simultaneously taking up three seats for the endeavor. Can you beat that? Any of these acts can be cancelled out as unacceptable if you bring a really cute kitten to class, especially if said kitten pokes their head out periodically to remind all those in class that there are beautiful, simple things in life. Also, that lectures, however long and complicated they may seem, eventually end. Happy studying! Only 9 days of instruction left.